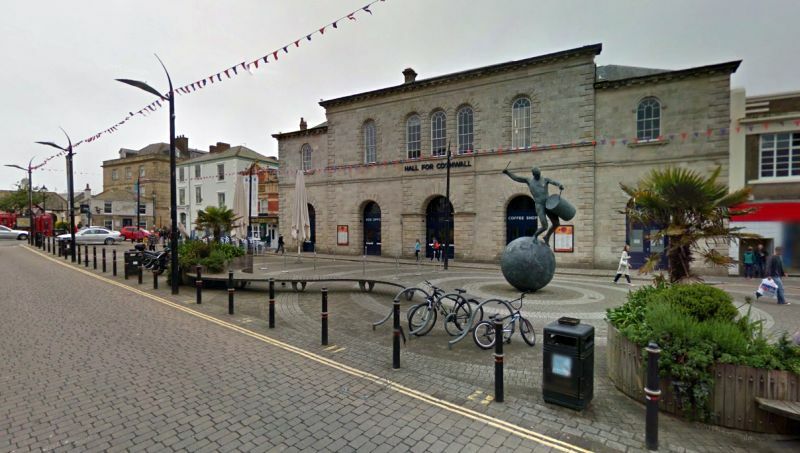 The Hall for Cornwall is a Theatre situated in Truro, Cornwall which began life as a Town Hall back in 1846. The building's exterior was constructed from Carn Brea granite and is still extant today, although the interior has been remodeled on several occasions. As well as being constructed as a Town Hall the building also originally housed the City's Magistrate's and Stannary Courts, Police Offices, Cells, and the local Fire Brigade. In 1909 the building's use changed when it became a Public Hall and housed events such as early cinema and even a skating rink, but in 1914 the building was gutted by a major fire. In 1925 the building was remodeled to include a theatrical space with its own stage and it then played host to theatrical productions for many years, along with regular Public Hall functions. Right - The Stage and Flies of the Hall for Cornwall in July 2016 - Courtesy Michael Shaw. After a period of neglect spanning some 30 years the Hall was eventually rejuvenated when it was converted into a modern Theatre called The Hall for Cornwall which opened on the 15th of November 1997. 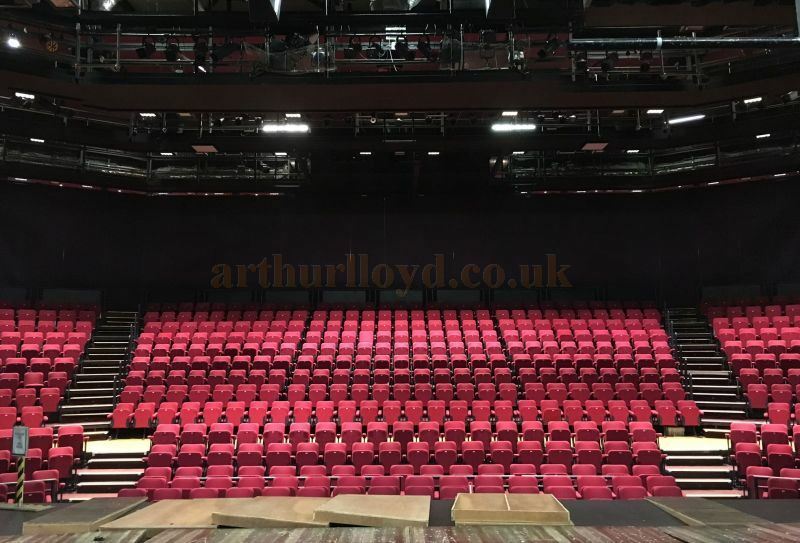 The Theatre today has seating for close to a thousand people and is Truro's main theatrical venue housing all manner of productions including plays, opera, ballet, concerts, comedy, and West End Musical touring productions. Arthur Lloyd is known to have performed in Truro with his tour of 'Two Hours Genuine Fun' on March the 6th 1871, quite possibly at the Town Hall, now the Hall for Cornwall. 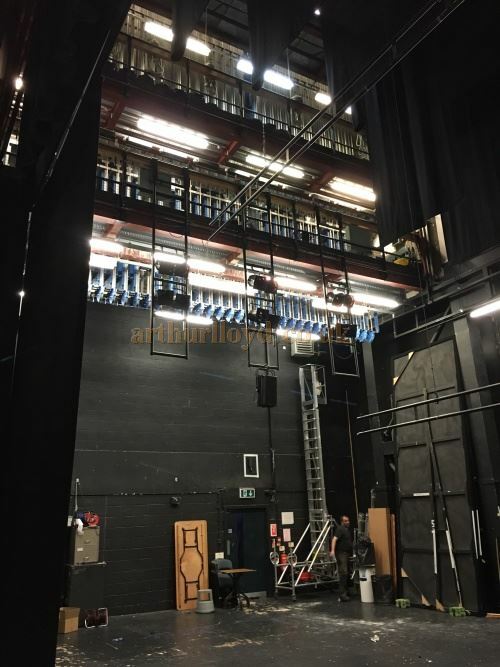 Above - The Auditorium of the Hall for Cornwall in July 2016 - Courtesy Michael Shaw. The Hall for Cornwall is currently in the planning stage for redevelopment and improvement of its facilities, details of which can be found here. You may like to visit the Theatre's own Website here. 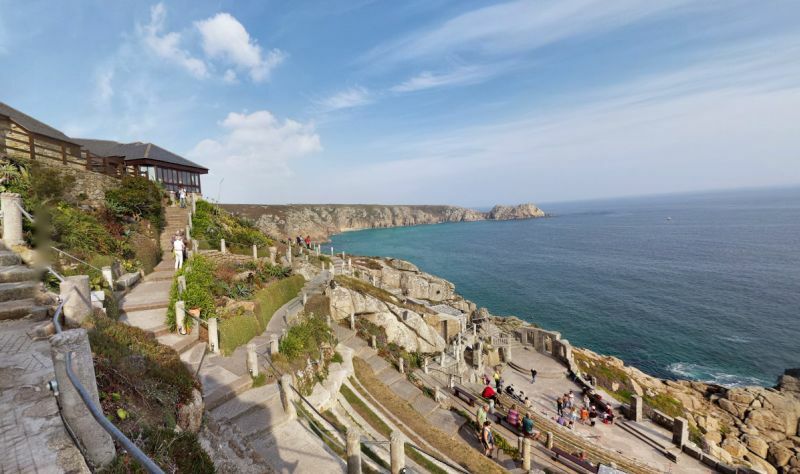 The Minack Theatre opened on the 16th of August 1932 and was the brainchild of Rowena Cade who lived in Minack House, which is situated above the cliff top site of the Theatre. In 1929 some local drama enthusiasts had staged a production of 'A Midsummer Nights Dream' in a meadow about a mile inland from the present Theatre, and due to its success, the group wanted to find a venue for a production of their next play 'The Tempest'. Rowena Cade thought that the cliffs below her garden would be the ideal spot so she and her gardener spent the next few years creating a terraced ampitheatre out of the previously jumbled cliff edge, with a stage consisting of a flat grassy area below. The production of 'The Tempest' was a great success and over the following years the Theatre was further enhanced. The war intervened in 1939 and the Theatre was closed for the duration but did reopen, after much rebuilding, in August 1951 with a production of 'Tristan of Cornwall'. A Pill Box from the war years served as the Theatre's Box Office on its reopening and remarkably was still in use right up until 1998 when a new Box Office, shop and cafe were constructed. Today the Theatre also has an Exhibition Centre which tells the whole story of the Theatre from its humble beginnings to the popular attraction it is today. The Minack Theatre today also includes modern lighting and sound, all controlled from a room constructed within the rocks above the stage, and is a very popular attraction with more than 150,000 visitors a year. 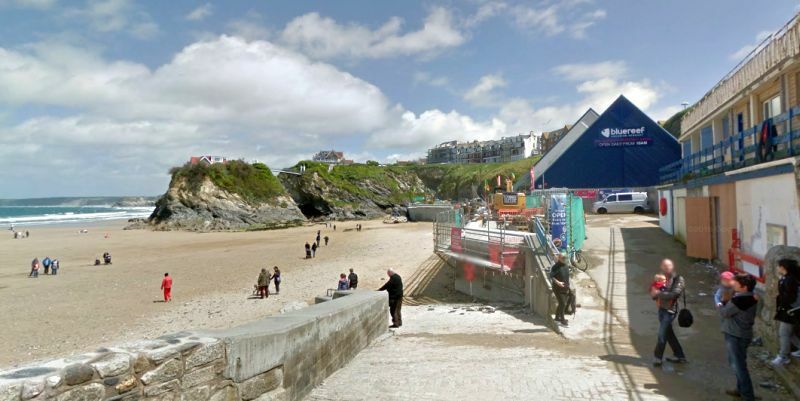 Above - A Google StreetView Image of the site of the former Cosy Nook Theatre, Newquay, now the Blue Reef Aquarium - Click to Interact. The Cosy Nook Theatre was situated on the seafront at Newquay and was the Town's main Theatre for many years. The Theatre was built by Newquay Urban District Council and opened in 1929 with a tiny auditorium capable of seating just 388 people, although a more respectable capacity of 550 was created in 1962. None the less it was a very popular venue, staging all manner of productions over the years, including its regular Summertime Specials including 'Gay Time' which ran throughout the 1950s. The Theatre was also host to some very well known names including Clive Dunn, Benny Hill, Ray Alan, David Nixon, Paul Daniels, and Phillip Schofield. Clive Dunn was playing at the Theatre in 1947 when a serious fire broke out on stage and the Theatre was closed until it could be restored and reopened. 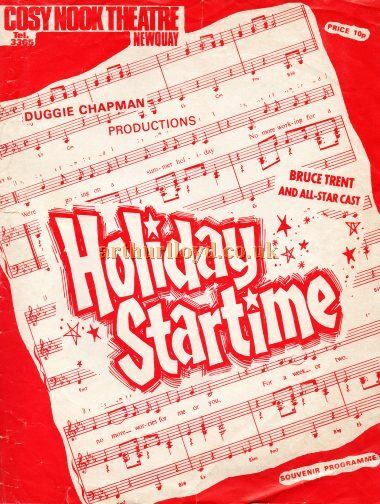 Right - A Programme Cover for Duggie Chapman's 'Holiday Startime' at the Cosy Nook Theatre, Newquay - Courtesy Keith Hopkins. Perhaps surprisingly, when you consider so many Theatres were closed and demolished in the 50s and 60s, the Cosy Nook Theatre continued long after that and was not finally closed and demolished until April 1991. Newquay's Blue Reef Aquarium stands on the site of the Theatre today, and on the 22nd of November 2013 Philip Schofield unveiled a plaque there commemorating the Cosy Nook Theatre. A book on the Theatre by the BBC Radio Cornwall Broadcaster Chris Blount, 'Theatre By The Sea: The Story Of Newquays Cosy Nook', was also launched there on the same day, with signings by the author and Phillip Schofield. A very nice photograph of the Theatre by Ian Grundy can be seen here.